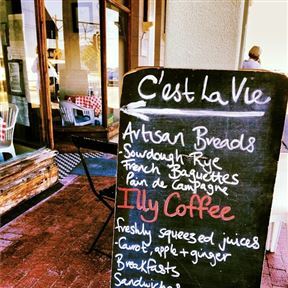 In its cobbled street setting in a lane off Main Road, C'est la Vie has all the charm of a rustic European sidewalk cafe. 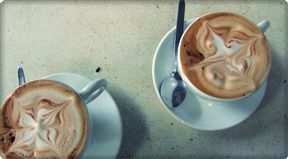 With their own bakery on site and one of the top 10 best coffees in Cape Town, as mentioned in Elle Magazine, patrons can enjoy the best artisanal breads with their morning cappuccino's. Coffee is taken very seriously at C'est la Vie as is evident by their poster inside with the motto, "You haven't had enough until you're shaking!" Offerings on the menu are sweetly presented on wooden boards, with handmade cups and ceramics. Breakfasts are simple and fresh, with expertly crafted sandwiches taking centre stage over lunch. Fillings include brie and fig preserve, salmon and cream cheese and other delicious delicatessen style delights. Regulars at the coffee shop know to bring baskets along to their morning coffee, which they pack with brownies, cheese sticks, croissants and freshly baked bread from the bakery shelves. Experience C'est la Vie for a morning and you'll be embracing the carefree, artistic spirit of Kalk Bay. C'est la Vie is 22.3km from the centre of Cape Town , the nearest airport 23.8km (Cape Town International Airport).